Stepping on to the European Stage in Glasgow: Galway’s Emma Slevin, Kate Molloy, Blathnaid Higgins and Jane Heffernan. Four young Galway girls are being heralded for improving the standards of gymnastics in Ireland. Emma Slevin (Claregalway College ), Jane Heffernan, (Salerno Secondary School ), Kate Molloy (Salerno Secondary School ) and Bathnaid Higgins ( Calasanctius College ), all from Renmore Gymnastics Club, were members of the recent women’s junior gymnastics team to represent Ireland in the 2018 European Championships in Glasgow. 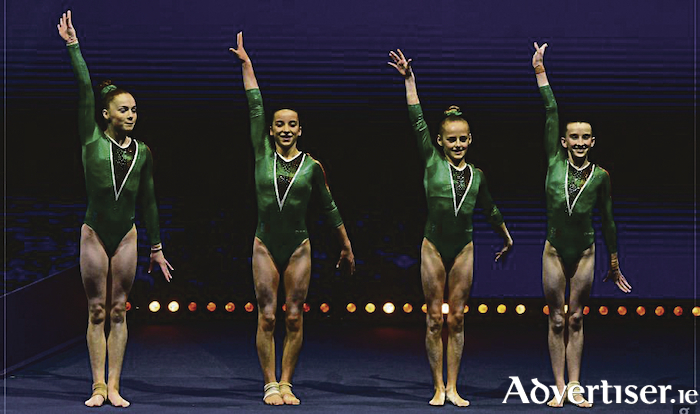 The quartet made an impression with the gymnastics bloggers who remarked on the huge improvement in standard of the next generation of Irish gymnasts. This young team which trains 26 hours a week leapfrogged the rankings to score a total of 140.764 and finished in an impressive 15th place. Commenting on their performance, CEO of Gymnastics Ireland Ciaran Gallagher, says the junior women represent "a new standard of female gymnast that Ireland as a nation has not produced before". "It is only the start for them, they are a credit to our emerging performance system. On behalf of all at Gymnastics Ireland I would like to congratulate the gymnasts, coaches Sally Batley and Giacomo Camiciotti, and our performance and technical manager Sally Johnson on a great championships." Speaking of the results Sally Johnson, says the junior team hit their targets and competed exceptionally well on bars showing greatly increased standards for this apparatus in Ireland. "The gymnasts have an exciting future ahead of them and we look forward to them turning senior within the next two years."